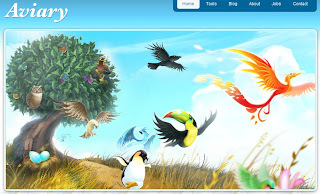 Living Online: Aviary, All-In-One Web Tool? Aviary is a platform ecosystem for people who create. It is organized around a suite of rich internet applications geared for artists of all genres. From image editing to typography to music to 3D to video, it is a tool for everything. Now, Aviary only registered by invitation, I do not have invitation so I can not say anything about this site. But its main page has a beautiful 3D picture, I love it.